east side bride: boutonniere and suspenders - wtf? boutonniere and suspenders - wtf? I'm making a really great boutonniere for my fiance, but he will be taking off his jacket after the ceremony. Can I pin it to his suspenders or am I breaking some cardinal boutonniere rule? Do I just pin it to his shirt? That seems dumb. Does he just lose all boutonniere privileges by losing the jacket? ps - I totally googled how to spell "boutonniere" and have copied and pasted it rather than typing it every time it appears in this email. Yeah, no. When the jacket comes off the boutonniere is donesies. You can't just keep moving the damn thing around. BIG NO-NO. you won't be carrying your bouquet around all night, so why should he have to wear the boutonniere all night? Reason #312472354 why the boutonniere mystifies me. I'm a pocket square girl, myself. Skip the boutonniere! Go for the pocket square! 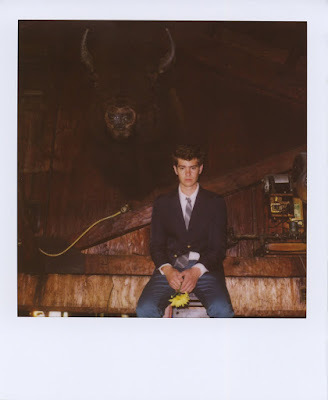 First, the Band of Outsiders pic is amazing. Second, great advice . . . But why is the jacket coming off during the ceremony?? Because it's easier to play Corn Hole without a jacket. Duh. My husband didn't wear a jacket to our wedding at all, and neither did the other men involved in the wedding, so we pinned the bouts to the guys' shirts. Probs not the "right" thing to do, but it looked fine. how pissed off will my family be if I elope? who doesn't love a bride in a ZEBRA MASK? have I got some wedding clothes for YOU. How can a slob reinvigorate her wardrobe? Dear ESB: What do I wear around my neck? Dear ESB: Is a potluck wedding REALLY that tacky? How NOT to tell your guests what to wear. remember when I said I hated tights?? Should I let my sister ruin my wedding?